Updated "7 by 9" list with the cards changed out. Going by the "7 by 9" rule is a bit hard for this deck as most of it relies on the numbers of the cards. But here's a breakdown as close as I could get for it. There's only really 5 categories of effects. While the other 3 just break down the number of countdown numbers of random cards. Ok, thats a nice solid start and a strong idea. Modern is a turn 4 format- usually non-casual games are decided by turn four in one players favour, so most cards are at the 1-2 cmc, with key cards castable turn three. 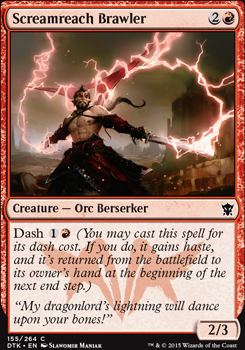 I love the idea of a kor firewalker/dash setup, it has a lot of potential, especially running a lot of removal. So lets start by looking at cards, costs and interactions and alternative multiple copies. Basically, the deck as you described it should run two sets of cards- things to enter the battlefield or benefit from entering the battlefield, or things that remove your opponents threats so you can grind out a win. Removal- Fumigate, Flame Slash, Lightning Bolt, Stasis Snare all fantastic, with this setup Blessed Alliance, Celestial Flare, Immolating Glare are all options, with Leave No Trace, Radiant Purge, Disenchant, Urgent Exorcism and Valorous Stance, with the traditional red Smash to Smithereens and the like. Things I'd cut - Shivan Dragon(classic, but reducing the mana costs of the deck mean stuff hits the battlefield faster and you can run less lands) Resolute Blademaster Cinder Hellion Belligerent Whiptail too slow to cast when you need them, need you to already be winning to work. Fireball Heat Ray Armored Ascension Lust for War- slow and don't suit your gameplan of bouncing creatures for effect. Interesting cards to consider- Legion's Initiative, damage, can protect your creatures by bouncing them, You could consider looking at the white Cloudform flicker archetype, soul sisters Soul Warden decks and RDW, which with key cards being reprinted may provide some good options. There is probably a card that has exactly the effect you want or need if you look for it, so its more about imagining what you want to be doing, and checking it can be done efficiently enough to work. The key part of it all is sideboard- this is how budget decks thrive in the modern envoronment. Cards to specifically mess with opponents, Disenchant key artifacts, Deflecting Palm a big creature into an opponents face, Combust key creatures in control decks. Its all there with the weird, optional, situation specific cards. Test your deck, see what works and what doesn't before commiting, then go out and play, because your playgroup and metagame will not condform to whatever is out here in the world, and what is best might not be fun to pilot, and thats the whole point of playing. 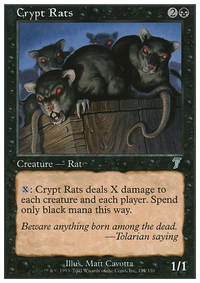 Don't be scared of playing on a tiny budget, there are a lot of cards that have fallen out of vogue and have low prices not because of how good they are but because they are unpopular eg.Nevermore. You can absolutely win most games by piloting well, even against the best decks and players with planning and a little luck. plusmental on Making Dash Great Again! I like the additions. In a dash deck the more wipe options you have the better. With N disk now you have some enchantment and artifact removal too, and playing in this group you will need it. 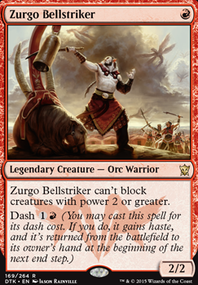 There are some pretty cool other dash creatures out there too that you might considerFlamerush Rider is good especially in 2 headed giant, where you might be able to copy ricks Ulamog's Crusher or something. Got a high dash cost which is something to look at but with Warbringer its not too bad at all. Esentially 5 mana for 2 3/3s and a copy of whatever else - ouch. 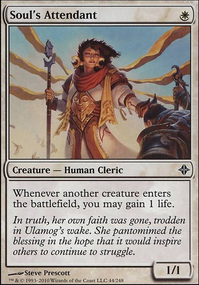 Id lose Kolaghan Aspirant for something like Mardu Scout essentially the same mana cost for the permanent creature, but with dash included and 3 power. 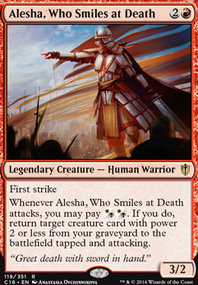 Mardu Strike Leader ive got an extra copy of if you want it. Vaultbreaker is Amazing! I just saw this and wow, so you pay 3, then if you want you get to discard a crappy card you dont need, and then draw a card? Not to mention 4/2, which few things will want to block, meaning you get to do it again. This guy is a must in your deck, which has little card draw - I would run 3 of him at least. Screamreach Brawler, Kolaghan Skirmisher, Kolaghan Aspirant, not enough damage (2) for what youre paying. They have added toughness but that rarely does much. 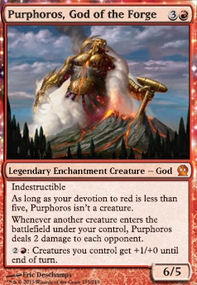 I would rather have the added damage of Mardu Scout, and to make room for Vaultbreaker and the like. I thought about it, but I'm not really sure that we can take a turn off to play it. Usually we either dash Screamreach Brawler or cast Roast/Grasp of Darkness when we have 2 mana up. But if I did put it anywhere, if the opponent would side in instant speed removal, it would be considered with some token generators in the sideboard. I like the theme a lot. I have a similar deck with Black included as well. I find Outpost Siege to be extremely effective in the mainboard due to how Dash interacts with the Dragons mode. It pings a creature or player for 1 when it LEAVES the battlefield. They Don't even have to die. If you are using Dash and Impact Tremors you will be doing 1 to a player coming in and 1 to a player or creature going out. Khans mode is also awesome with dash because you can dash them out of exile and they go to your hand after. Or, you know, free land draws which are needed with a 20 land deck. As far as sideboard options go, Boiling Earth is good to clear a path. Exquisite Firecraft is good for the extra reach to end the game or if they have some flyers that roast can't hit.